This report of the Commemoration of the Atomic Bomb in Hiroshima was submitted by Brad Rozairo OMI in August. The atomic bomb anniversary was solemnly remembered in Hiroshima. 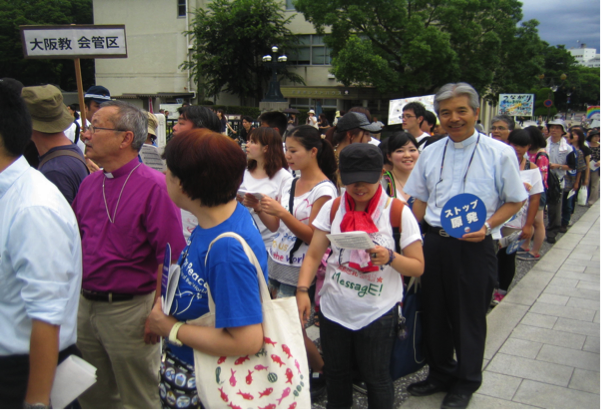 Every year the host diocese of Hiroshima conducts a series of programs both at the memorial cathedral and in other places like the peace memorial park. I was there to witness some of the events on Aug. 5th & 6th. The program proper began on 5th in the afternoon with a symposium on the prospect of ending nuclear generation. Bishop Tani, the head of the Commission for Justice and Peace, was the main speaker. The symposium also featured comments from a Korean resident of Japan who survived the bomb and from mothers who had been forced to flee Fukushima due to last year’s nuclear accident. 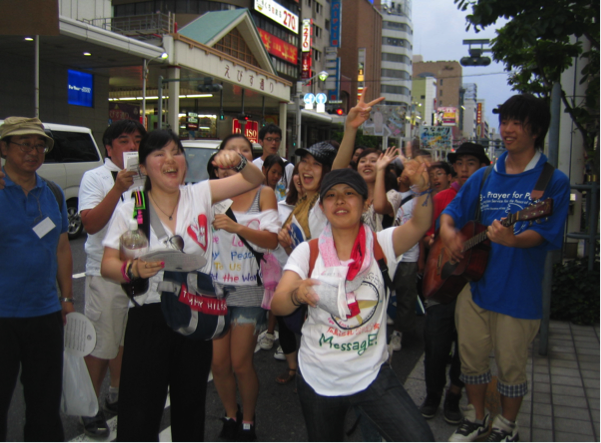 In the evening around 500 people joined the peace march. 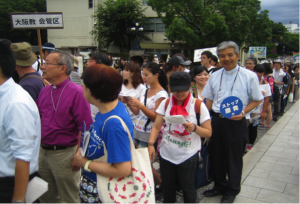 We marched up the main street from Hiroshima peace memorial park to the memorial cathedral. This year I noticed during the march there was a group of noisy pro-nuclear activists who were trying to make their voices heard. But that did not disturb the peace march. It was good to see the youth from different dioceses with banners and placards that read “No to nuclear energy”, “World peace” etc. joining the procession. Some had peace messages imprinted on their T-shirts! Some young men carrying guitars invited everyone to join them sing peace songs in a loud voice. (I think we were noisier than the pro-nuclear activists!). For me to join the peace march and to get soaked into that atmosphere itself was an experience. After the peace march reached the cathedral, a mass for peace was celebrated. The main celebrant was Bishop Maeda of Hiroshima. 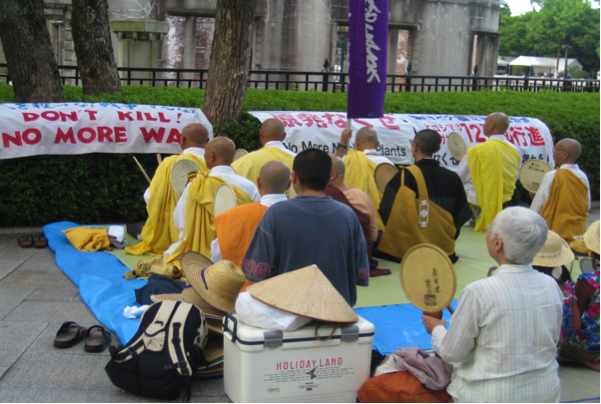 On the 6th, the day Hiroshima was bombed, at 6:15 in the morning there was an inter-religious prayer service held at the peace memorial park. Clergy representing different religions offered incense and recited prayers for the victims of the A- bomb. At 8 am a “Memorial mass for the Victims of Nuclear Weapons and all Wars” took place at the cathedral. Personally, for me to be in Hiroshima especially on 6th Aug. is something special. Every year when I go there I take time to listen to the stories of the A- bomb victims, watch some screen play on the bombing, listen to peace songs sung by different choirs and pray for peace. People offering flowers at the memorial monument, the smell of incense, the sound of gong etc. puts you into a mood that can not be explained by words. To be in that place the whole day and to be immersed in that atmosphere is a profound experience. I think I’ve got a special place for Hiroshima in my heart. That may be because I come from a war-affected country.